Need my Cozy Fire buff, plsthx! It was cold in the house yesterday. I think it’s a sign that Winter is on its way. 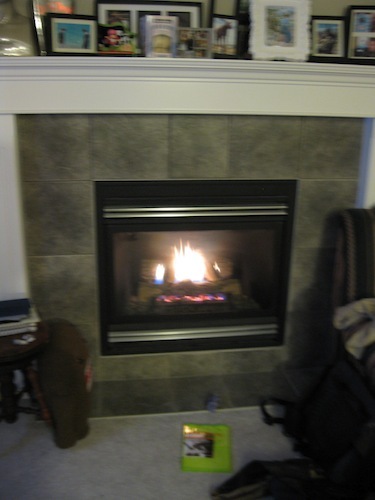 So Robin flipped the switches on the wall that would give us the Cozy Fire buff, and we settled in with some Hot Chocolate to watch a couple of PVR’ed episodes of Grimm. Grimm, by the way, was pretty good. Seeing a lot more fantasy of this sort – less Tolkien, more fairy-tale. I’ll be interested in seeing where it goes. We also watched an episode of Walking Dead. I can tell my blood pressure is elevated when just looking away from the screen during the suspenseful/gory parts doesn’t save me. What can I say…if there’s going to be a post-apocalyptic future, my hope is that it won’t be too gory. I’d never survive.